Scorpions are found in most parts of the United States. It used to be that they were only considered a “southern pest”, but in recent years have been found in many northern tier states. This is most likely due to them being relocated, along with nursery stock, since it is highly unlikely they have migrated any significant distance. 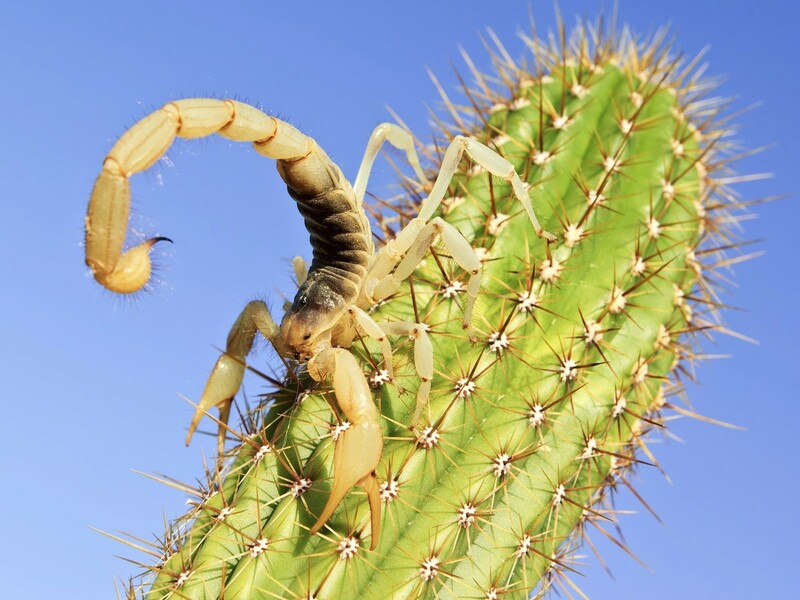 Though scorpions are mobile and will travel several hundred feet during their lifetimes, interstate relocation’s would not be possible without the help of man. Many shrubs, plants, flowers and trees are commercially grown in the south and then sold to markets in northern states. It is not uncommon for some unwanted “hitchhikers” to travel with such stock when sold and during this time, many pests will be relocated to areas where they normally don’t exist. Though the weather may be too harsh for most of these pests, some will find refuge in heated malls and other facilities which have controlled environments. Some will eventually find their way into homes and other buildings where they are able to establish themselves and start to reproduce. Though this is happening around the United States, the bulk of scorpion infestations are still most common in the mid to southern states and extend from the west coast to the east coast. Scorpions are generally a nocturnal animal; they prefer to be active during the night. They have poor eyesight yet thrive in the dark relying on their strong body, pinchers and stinger as a way to both defend and navigate any hostile environment. Scorpions have been referred to as “land lobsters” because they resemble something you would expect to see in the ocean – like a lobster – rather then a land dwelling insect. Scorpions have a three part body comprised of the cephalothorax (head), their main body or trunk which has 7 segments and their tail, which has 6 segments. The last segment of their tail works like a universal joint with a stinger attached. Scorpions are able to maneuver their tail in any direction and though most people think of them stinging in the classic “C” position with stinger over their head, scorpions will sting anyway possible when danger is present. Scorpions have 8 legs along with a set of pinchers up front which are quite strong and agile. They use these pinchers for hunting their prey, self defense, grooming and maintaining their young. Scorpions bear live young with litters containing 25-50 on average. These babies will climb onto the back of the mother scorpion where they will feed and grow for 1-3 weeks before moving off and out into the real world. Scorpions take a long time to develop. It is estimated that the average scorpion will molt several times during the first few years of life and reach maturity after 3-4 years. They will then go on to live 5-10 years in the wild; longer in controlled environments which are not so harsh. There are several species of scorpions in and around the United States. Some of the more common ones include the Black and Stripe Back Scorpion as well as the Bark Scorpion. The Southern Devil and the Slender Devil are also native to the States. These all have a stinger which can deliver toxins and poison which is in line with the sting of a wasp or bee. Like bee and wasp stings, there will usually be some pain followed by swelling and discomfort for several days. However, the sting of the Sculptured Scorpion can be more of hazard. These stings can be deadly and have accounted for many deaths over the years. The Sculptured Scorpion resides in Arizona, New Mexico and parts of Texas and California. It happens to be among the smaller sized scorpions reaching 2-3 inches at best. One key to identifying this species is the length of their pinchers. The pinchers on the sculptured scorpion will be quite long compared to other species. As with all scorpions, you should not handle them or touch them. If you live in an area where they are present or a home which has scorpion activity, take care to avoid contact with them. This video shows what the common Pine or Black Scorpion looks like. Scorpions are predatory by nature and feed on a wide array of insects. Their strong pinchers, along with their venomous sting, enable them to be fierce and effective hunters. Scorpions will be active mainly at night choosing to rest and hide during the day. Prime locations where they might nest or hide includes under rocks, mulch comprised of pine straw, wood chips or compost, logs, flower bed coverings made of vinyl and other weed reducing material, railroad ties, patio slabs and just about anything found in and around the home which is part of the landscape. At night, scorpions will forage looking for food and mates. Though scorpions have 2-12 eyes, they don’t see well. Instead, they rely on their strong yet sensitive pinchers to both feel and grab their prey. Prime food targets include roaches, ants, grasshoppers and other ground dwelling insects. However, most any scorpion will readily accept a termite if they had to make a choice. This is thought to be true since termites are so fleshy, nutritious and bountiful. For this reason, scorpions tend to be attracted to areas which are moist, shady and full of insects – classic conditions for most any insect population – especially termites !! Scorpions present a hazard both in the yard and in the home. They love to reside where it is moist and irrigated lawns and landscaping will naturally attract them. It is thought they are coming for the other insects on which to feed but regardless of why they come around, once they are found in the grass and turf some will undoubtedly find their way inside. For this reason it is important that you address outside populations on a regular or maintenance type program. As is the case with many perimeter invading pests, by keeping outside populations in check, you can dramatically reduce the risk of any getting inside local structures. This will help to reduce contact with people which in turn will help to minimize the chance of anyone getting stung. Around the home, scorpions love to nest in flower beds, mulch piles, under wood chips or pine straw and in garages which store a lot of boxes or other items on the floor. The scorpions flat body lends itself well to being able to crawl under most any object. This ability to crawl into small cracks and crevices is what makes the scorpion a common invader to our living environments. Scorpions are great climbers and will readily scale brick, wood, stucco and most any siding on a house. This means if you let them live around the home, some will invariably move inside. They do this seeking both warmth and refuge and once inside, will require extensive treatments to exterminate established populations. Treating them outside is both easier and less costly and should be done on a regular basis if you reside where scorpions are present. Controlling a scorpion problem involves treating the main nest sites and keeping a “scorpion free” zone around the home. If you preventive treat for scorpions, you can many times reduce the population living around the home so few if any come inside. This is by far the best approach. So if you’re seeing some in the yard, don’t wait. Treat now and in the long run it will prove a lot easier to get rid of them. Once inside the home, there are various products and methods needed to deal with the locations they’ll most likely want to nest. There are two types of preventive maintenance which should be done around the home. First, apply DELTAMETHRIN GRANULES around the home quarterly. Use them monthly for active problems; once every 3 months to make sure they don’t return. Deltagard should be applied at the rate of 5 lbs per 2500 sq/ft of mulch, grass or flower beds. Treat at least a 10 foot band around the home; a house 40 ft deep by 60 feet wide would require 5 lbs to treat this 10 foot band. A good push behind fertilizer spreader can be used to apply the Deltagard. 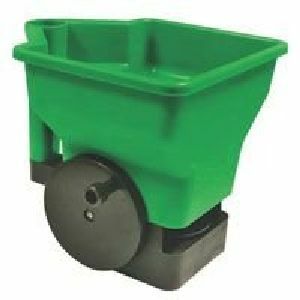 For landscaped areas, you might find our GRANULE SPREADER to be easier to use. Deltagard granules pose no hazard to people or pets when applied properly. Since the Deltamethrin Granules are slow acting and need a week or so to “kick in”, the use of a liquid material over the turf will be needed if you want immediate knockdown. CYKICK CS is an excellent material for this type of application. Use 1 oz per gallon of water and use the mixed spray over 1,000 sq/ft of turf. 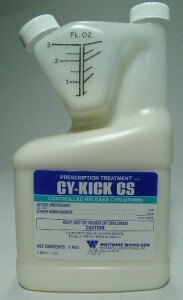 Cykick is unique in that its a time released microencapsulated formulation. This is important and very much needed when treating for scorpions. The active won’t be absorbed by the turf or concrete but will instead lay on treated surfaces ready to be picked up by foraging insects like scorpions. Retreat monthly for active problems; once every 2-3 months to make sure they don’t return. You’ll need a good PUMP SPRAYER to apply the Cykick; make sure it can provide a nice wide “swath” when spraying. This will insure proper coverage and uniform dispersion. For treating the whole yard, the 20 GALLON HOSE END SPRAYER. will prove easy to use and efficient. This is the type of sprayer that connects to your garden hose. Add 4 oz of Cykick and fill it 1/4 to 1/2 of the way to cover up to 5,000 sq/ft of turf. Using the water from your garden hose will prove easy and a real time saver for large treatments. 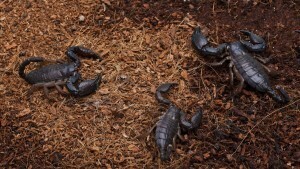 Getting the local turf, flower beds and mulch areas soaked will insure you penetrate down where scorpions like to hide. Be sure to spray the sides of the home with it as well. Direct the spray at the foot of the foundation and come up at least 3 feet. Since scorpions will regularly climb up just about any building, treating the side of the home is important and should be done a regular basis. Just keep children and pets away when the application is done but they will be able to safely access the treatment sights once all areas are dry. This will usually be within an hour of the application. Anyone with current nesting and scorpions active in the home should be taking a lot of precautions to insure occupants don’t get stung. Be especially careful at night when walking around. Since scorpions are nocturnal, it is highly likely that you will encounter them when it is dark. Try to wear slippers, sandals or some other footwear to minimize the possibility of being stung when walking around. 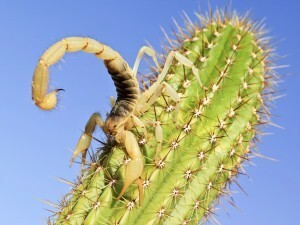 Stepping on a scorpion is one of the more common ways people get stung so be careful at night! If you see scorpions on a regular basis in the home during the night, get a BLACK LIGHT to help identify where they are located. Scorpions reflect the light making them very visible and easy to see. Check out this video to see just how easy a scorpion is to see when using our Black Light. Black Lights are a great tool to help avoid contact and should be used by children, elderly persons or anyone that is overly sensitive to a scorpion sting. For extra protection, arm yourself with a HAND HELD ZAPPER. 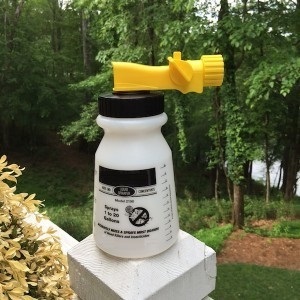 This device is a neat little tool that can be used on scorpions, spiders, roaches, wasps, bees and just about any unwanted insect. 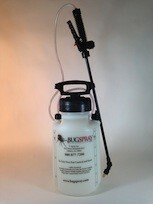 It works by electrocuting the targeted insect and is very effective and handy to have around. Another great tool to help locate prime scorpion nest sites are SCORPION GLUE TRAPS. These have a unique insect smell scorpions will notice and once they smell it, they’ll want to enter. Undetectable by people, these traps should be used in any room where scorpions have been seen suspected to be living. Traps should be placed along baseboards but other key places to trap scorpions include closets, either side of any door leading outside (especially garage doors), basements and attics. Set them out every 10-15 feet and change them quarterly; immediately once filled. Since scorpions are great climbers, it is very common for any house to get them active on the second level or upstairs. This happens because scorpions will readily climb the outside of the structure and enter around the roof line or soffit leading to the attic. Once inside, they will nest in the insulation and wood work of both attics and crawl spaces. In fact, it is very common for homes to have scorpions living in these two areas for some time before they are ever noticed. This is because attics serve host to many invaders. It is very common for wood roaches, ants, beetles, flies and other pests to enter attics and never make it to living areas. If the frequency of sightings in the home leads you to believe there could wide spread nest sites, there are a few products that should be employed. The first to use is PT-PHANTOM AEROSOL for any crack or crevice where you suspect they might be residing. This product comes with a thin crack and crevice tube that enables one to direct the material deep into spaces where scorpions like to live. Phantom will kill them slowly (about 2-4 days) since it’s not fast acting. But this is very much by design. 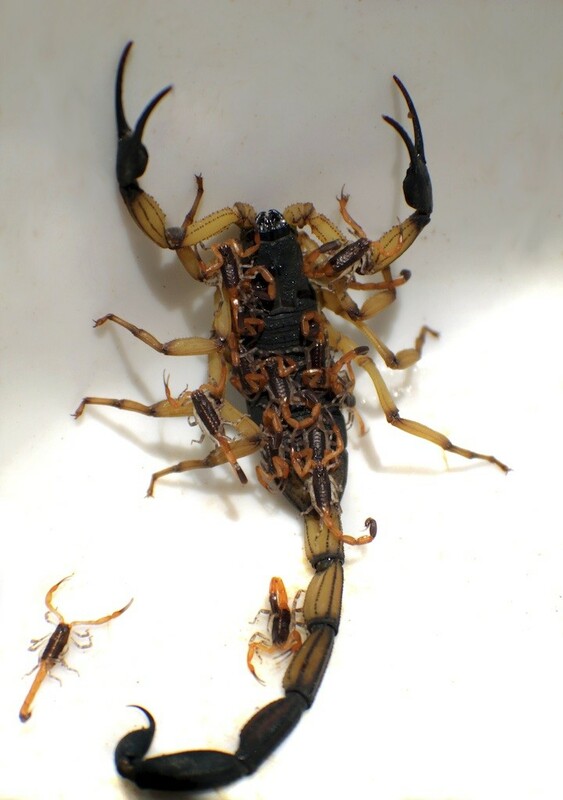 Phantom’s unique formulation enables it to work slowly and during this time following their initial exposure, scorpions which touch the treatment can “share” it with other scorpions. This enables the treatments to have a much bigger impact. Plus Phantom goes on dry and odorless. For inside applications, this is a big advantage. Treatments with Phantom will last 2-4 weeks when applied to non-porous surfaces. Focus your application to the baseboard molding, around door and window frames, around air flow register frames and generally anywhere there are slight voids, cracks or crevices that might host or allow scorpions to enter. Within a week, you should start finding dead scorpions. And if you treat once a month, the problem won’t be able to get established again inside. Phantom is well suited for small homes or houses with hard wood floors. But if you have a big house and a big problem, the CYKICK CS listed above can be sprayed inside. Mix 1 oz per gallon in a good PUMP SPRAYER like the one listed above and use the mixture to spray baseboards, under furniture, etc. Cykick is odorless and does well inside for a wide range of pests like scorpions. For longer protection compared to spraying the Phantom or Cykick inside, consider the use of a dust called DRIONE. This dry, highly repellent dessicant is very different acting in that scorpions hate it and will avoid where it has been applied. For this reason, Drione is better suited for the treatment of electric outlets, light fixtures and other routes of entry to living spaces. In fact treating these locations in addition to spraying is a good idea. But you could opt to use nothing but Drione and get it applied to all baseboards instead of spraying on a regular basis. Drione only has to be applied twice a year when problems are active; once a year to make sure they don’t return. This long lasting residual makes it a good choice for keeping the inside areas scorpion free if you prefer to use something long lasting requiring less upkeep. The only “downside” to using Drione is that its light and “white” like confection sugar so it will be visible where applied. Try directing applications to cracks and crevices where scorpions want to use for nesting or entering the room and use a HAND DUSTER to help with the treatment. They will allow you to make precise applications and to help minimize waste. Any applied which misses the target sight can be wiped up with a damp paper towel or rag. Once Drione gets wet, it loses it’s effectiveness so don’t saturate the treated areas with water. Since scorpions like to climb, they’re more likely to be in the attic instead of a crawl space. But once they find this good place to nest, it won’t be long before the first few living in your attic will mate and start to reproduce. Once the young start leaving their mother, they will forage out and though many will stay in the attic, others will forage down into living areas. The same thing can happen in crawl spaces. If you have one or two scorpions being found in living areas over the course of a year, this is probably due to the local outside population which needs to be addressed with the outside treatments described above. However, if you are seeing a lot of small, young scorpions or if you see one or more adult a month, you most likely have an active population in the attic or crawl space which needs immediate attention. For dry, arid attics, the DRIONE DUST listed above is well suited. But since attics and crawl spaces can be damp, DELTAMETHRIN DUST. is better suited. Its a true insecticidal dust but its moisture resistant so it will stand up well to water and heat. 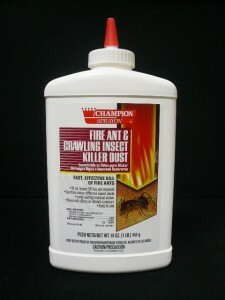 It is very active on a wide range if insects including scorpions and treatments will last 6-12 months. 1 lb will cover up to 2,000 sq/ft so it goes a long way too. To disperse the Deltadust, use a DUSTIN MIZER. This device will “blow” the dust out a good 10-15 feet so if you can move about the space just enough, you should be able to get the treatment done using this manually operated tool. But if you do not have good access to the space, rent our ELECTRIC POWER DUSTER. 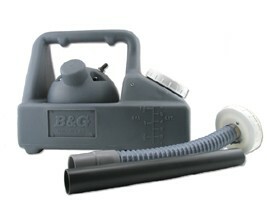 This will blow the dust 30-40 feet and will allow you treat large areas in very little time. Scorpions are a pest found throughout most of the United States. Though most don’t have a sting which is deadly, at least one does so don’t touch or handle them. Since scorpions like to crawl around in the dark, people have a tendency to step on them during the night and get stung this way so be careful if you are finding them in your home. Use a Black Light to help see any which are out; the Hand Held Zapper is another good tool to keep around if they are in the home. Treat the outside with the Delta Guard Granules and Cykick CS spray to keep numbers under control but you will have to do some dusting and liquid treatments inside once they get in the home. Use the Deltamethrin Dust for attics and crawl spaces; the Drione is best suited for treating the perimeter of rooms you don’t want scorpions to enter. Phantom aerosol is handy for areas where the dust is too messy, such as under baseboards or furniture, so keep a can of it around. Use either the Lamda-Cyhalothrin or Onslaught for long term residual that can be sprayed. Both are very active on scorpions, odorless and easy to apply. Since scorpions can take a long time to develop and infest a home, it might take several months before you get the problem under control so have patience when treating. Remember to set out some Scorpion Glue Traps to help monitor activity and if you identify and treat nest sights the way we describe above, you will be able to knock them out once and for all!! Can this be bought in hardware stores ??? Every year I have a very bad Scorpion problem in spite of commercial spraying. Not at this time. But since we ship daily, the turn around time on orders placed with us is one business day which means you’ll have your product within a few days of ordering. And since these are the professional grade products, there won’t be any need to keep paying them if you get what they use and apply the products yourself. This will enable you to save a lot of $ and in doing so, get more product where it matters. So if you’re a “do-it-yourselfer”, doing your own pest control should be easy and productive. And that goes for scorpions too. Have had three in one month. One large black and the others smaller and orange. And in two different areas of the house. Is an all attic treatment the first thing to do? Thanks. V.
Actually, the first course of action would be to treat the yard and spray the foundation. If this is the first season you’re seeing them inside, it generally means the population outside has grown large enough to force some scorpions to migrate. And though seeing them inside the home is cause for alarm, failure to treat the outside means more and more will migrate to the living spaces. So for now, set out some Deltagard Granules and spray the foundation with the Cykick CS listed above. As for the inside; I suggest setting out some Scorpion Traps to monitor the situation. There is a good chance you don’t have any actually nesting inside yet and that the outside treatments will stop all inside activity. But if you capture more than 2 scorpions on the traps after you get the outside treated, then no doubt a good attic treatment with the Deltamethrin Dust would be smart. I’d also treat with the Phantom Aerosol in the living spaces making sure to hit all the cracks and crevices where they might be living. We have a cabin in the Texas Hill Country and have more scorpions this year than usual. We’ve seen four. Two on a porch which is raised on pillars and has cracks between the floor boards and two were between the cracks going to and fro. I found two in a shed type area as well. I looked for scorpions under the porch but found none. I imagine the granules scattered under the porch would work with the spray inside the cabin along the base boards. Your recommendations? I think your right on. As our article explains, these guys come around looking for food and if they’re finding a good insect population on which to feed, they’ll start nesting. To stop this from happening, apply the Deltagard Granules around the entire home. Next I’d spray the foundation heavy using 2-3 gallons of the Cykick CS. Inside the home I’d spray where possible with the Cykick. Cabins many times have wood floor with lots of seams, cracks and crevices that scorpions love. If your cabin has this kind of construction, the liquid spray would be the way to go. Especially if the wood absorbs the liquid well. But if it’s a fairly tight construction with little gaps for liquids to penetrate, get the Phantom Aerosol. It comes with a thin tube that enables you to treat small areas effectively. I live in Phoenix, AZ and I just moved into a house that was built in 1959. There are 9 fully grown palm trees on the property, as well as many other trees, bushes, etc. The property has been neglected for years, and …..it is a flood irrigated property. Grrrreat. Well, I have a major bark scorpion problem. Every night for the last 2 weeks, I take my black light and literally kill a minimum of 10 bark scorpions hanging around the house, yard, perimeter, etc. For my wack-a-scorpion patrol, I use a can of automotive brake cleaner that can be purchased at any local auto parts store. The problem is that it is about 5 bucks a can, and under very high pressure….meaning….you get a concentrated stream that will literally shoot 12 feet, but after 10 scorps, the can is about used. The benefit is almost instant kill, and the ones that don’t drop fast will sting themselves to death after being saturated. I have found 1 inside my house, but in an attached storage area…not so much the living area…however, the house has been neglected for years. There are…or were multiple openings from the exterior to the attic (that have been sealed recently)…but i fear that there is a nest since the scorpions have had free run over the property for years. I have spread delta-methrin granules all around the perimeter within the last 2 weeks, and still need to spray cykick. My question is…since sooo many are outside every night, should I basically “dust” the attic, or see what happens. I have never seen so many scorpions in my life…let alone a minimum of 10 kills per evening…. I am looking for suggestions…I am stuck for the next 2 years at this place..so I would like to nuke them off the property if possible..
As explained in our article, scorpions come around because of food in the form of insects. And any neglected lot that has water no doubt has insect food for scorpions. So is there any reason for the scorpions to move into the home? Probably not. And I know dusting won’t help the immediate problem you have outside so I’m not sure this is where you should spend your time, effort or money. What I do know is that you need to attack the outside. Apply Deltagard Granules once a month indefinitely. This will help. But immediately after you treat every month you should also spray over the top with the Cykick CS using a Hose End Sprayer. Also spray the siding of the home every time you treat. And these liquid treatments should be done twice a month and will require several gallons of material to be sprayed. By applying granules and spraying over the top, you should be able to effectively eradicate both the local insects and the scorpions living outside and by doing that, none will be around to migrate inside so the dusting of the attic would become a mute point. Ok, so I read pretty much the whole website and have a good idea of what to do, but rather ask just to be safe. I have lived in my house for three years. The area in which I’m located is well known for scorpions. But in three years I’ve only seen about two or three of the in my home the whole time. I do my own pest control and don’t really have any issues. That is until recently. We recently brought an older hi-five record player (basically looks like a dresser except that it has 2 speakers and a record player built into it) and in the week that it has been in my home I have seen four scorpions. Two within a few feet of the item I’m talking about (at night), one in the opposite side of the home, and one leaving my laundry room out to the garage (maybe 15 feet from the room item is in). Needless to say I think the scorpions are living in the furniture item. Maybe in the speakers because there are holes in the back of the dresser like a real speaker would have and I think it would make a great nesting area. Thus, I can’t see if this is really the case with a black light. There is no way to open the back or see inside without destroying the object. I was stung twice and I have a young child in my home, who I recently found a scorpion on him, but didn’t get stung. I am very worried that it has something to do with the new furniture item. There is no way to get rid of it, I’ve already tried talking about that option and my other half refuses to budge. So is there some way to treat the item itself, without ruining or breaking it by doing so? I am already doing pest control myself for the exterior and interior of my home with some stuff from home depot (such as granules and spraying). I would just feel more comfortable if I knew if the furniture item was really a issue or not, and if it is…treating it before the problem becomes a entire home infestation. So please tell me any and all of your recommendations! I would start by recommending you move to the professional grade products we have listed in our article above because they’ll work much better compared to common retail actives you’ve been using thus far. I’m sure the weaker products you’ve been using has allowed some scorpions to thrive outside the home and this could very well be the main source of the current activity. So for the outside, start using the Deltagard Granules and Cykick CS. As for the inside; I suggest you set out plenty of scorpion traps to help let you know the problem areas as well as trap some of the active scorpions. These are a helpful tool for sure. Lastly, this “hi-five record player” could very well be infested. I’ve seen furniture harbor all kinds of insect pests (including scorpions) so this is very much a possibility and a potential nest site. Now how to treat it without getting inside could be tough but here are a couple of options. The first way to treat it could be done if the unit has legs which aren’t too wide. So the way you describe the unit is that it “looks like a dresser” and the dressers I have here in my home all have what we call “corner legs”. Basically these are located in the corner of the piece, at ground level, and are two pieces of wood which form an “L” shape. Each leg has two sides and each side maybe is 2-3 inches long. So if you have legs like these or the just common round, kitchen table legs on your unit, you can set out large glue traps under them which will capture the scorpions as they come out to forage. Here’s what I mean. Lastly, a more direct approach to the problem would be to treat the unit using the Phantom Aerosol listed in our article. This product goes on “dry” when used properly and if you sprayed it into the unit (slow, short blasts into every crack, crevice hole and access point) you’d no doubt get enough of it treated so that any scorpions walking over the treatment would pick up the active ingredient in the Phantom and over a few days succumb to the exposure and die. I’d also lightly mist the outside of the wood to make sure all surface areas they might be using were treated. DUSTIN MIZER when dusting for Scorpions? In the 500-1000 foot range. Most attics will need 1-2 lbs. Just moved to a new house on the very edge of DFW. Nothing but fields for miles. Been here 2 months and have found 2 of the striped back scorpions in the house. These are all I have ever seen around the DFW area. Fairly harmless but still, I don’t want anybody stung. The 1st one was an adult. I found it in the middle of the day. It was staggering and ill. The 2nd one I found was dead. It was a little over an inch long so a lot younger than the 2+ incher adult. I have been treating the outside for carpenter ants. I used some kind of Bayer spray for carpenter ants inside and outside when we 1st moved in. I have also followed up with 7 dust around the perimeter. The only bugs I find are dead ones, other than the scorpian that was sick.The carpenter ants have disappeared. There is a swimming pool on 1 side of me and the other side begins miles of prairie. Just wondering if they are living in the house? Coming from the wilderness so close or are they coming from under my neighbors pool? Also, I am right on a golf coarse. May have to get a blacklight and go hunting. At least the spray and dust is effective enough to where they quickly die on entry, but I want total scorpian genocide. Any theories are advice? I’ve got several thoughts and advice. First, as our article explains, scorpions are nocturnal so what you’ve seen would represent a very small amount of what’s active. Maybe just 1-2%. That means there is a lot more you’re missing. For starters, I’d invest in the Black Light for sure. Second, the fact that you’re seeing these in the house is cause for alarm. Here’s why. No way any treated scorpion comes “inside” after being sprayed outside. That means you had at least two inside that succumbed to your spray. And since no common retail Bayer product can handle scorpions like the products we have listed above, I’m sure there are plenty more where the two you found came from. So that means you need to step up to the Cykick concentrate listed above. And once you get it, treat the outside and inside right away. Now based on where you’re located (between water and prairie), I’m certain there will be scorpions commonly active around your home. They’ll be attracted to the moisture and no doubt insects that are attracted to the area for obvious reasons. For this reason getting the outside treated with some Deltaguard Granules is strongly advised. They’ll surely intercept any foraging scorpions and in doing so, prevent them from being able to establish nests. In the end, controlling the outside areas close to your home is what will help to maintain a scorpion free living space. Lastly, install 5-10 Scorpion Traps around the home. You won’t have to keep these out all the time. But I would get some and set them out for at least a month to make sure there is no activity coming in from above. In other words, there could be nests in the walls or attic and using traps inside can help alert you to this activity. How will the dust perform in an attic that has loosely sprayed fibrous insulation material in it? Will that “insulate” any scorpions that may be crawling underneath it? If so, what other type of pesticide would you recommend? Thanks. Dusting with Drione is the best way to treat any attic. Here’s why. Insects commonly crawl up the side of homes and when they reach the top, they’ll forage out onto the roof or hang around the gutters, soffits and facia boards. It’s here where most enter the attic. Attic vents and all the seams where the roof meets the sides of the home offer up a bunch of cracks and crevices through which crawling and flying insects will pass when these areas are left unprotected. Inside the attic, this entry point is the outer “edge” of the “floor” or basically where the insulation meets the bottom of the roof decking. These areas are usually tight and tough to reach because of the nails that protrude out from the angled roof decking. That means you’ll need to treat them from afar. And though spraying a liquid is an option, liquids won’t last anywhere near as long as a dust and due to gravity, there is a very high chance of anything liquid used in the attic of leaking down to the living spaces below. This would be bad and one of the main reasons why liquids are not commonly used in this space. And though aerosols are an option; they won’t last long. Basically you’re talking about a few weeks of residual from the very best aerosol but with a dust like Drione, you can get a year or more of protection. And when the Drione is applied with a Dustin Mizer pointed to this exterior entry point around the perimeter of the attic, this tough to reach space can be treated thoroughly and easily from afar. Additionally, the Drione can be directed to the bottom of the roofing deck as well and because of the static charge it will get when used in a Dustin Mizer, the bottom of the roof deck will get coated with the Drione and treated well. This is important since so many pests like to use this area for nest making. Most importantly, insects like scorpions hate Drione. So even trace amounts of it placed in key areas will keep them away. No other product has this repellency feature and in the end, aren’t you wanting to keep them out of the attic? Well, if that’s true, then Drione is the way to go. And these same advantages of using Drione can be employed from the living spaces as well. Because it’s so highly repellent to pests like scorpions, it’s not likely that any will pass through the barrier you place in the attic if the application is done correctly. But just in case there are some already living in the attic, you can effectively keep them out of the living spaces by dusting any route of entry like electric outlets, light switch boxes, light fixtures and any hole where a drain pipe, vent pipe or electric conduit passes through a wall or ceiling. Using nothing more than a Hand Duster, these entry points can be dusted and essentially made unpenetrable by placing a small amount Drione in any void, crack or crevice you can find. This is one of the strong points of Drione and if you treat these areas as well as the attic thoroughly enough with this dust, you won’t have to worry about any pest living or using these areas for a year or longer. I live in Georgia, in a small upstairs apartment of a detached garage, which is bordered by fairly thick woods. I found 2 scorpions in the bathroom sink a week ago. Last night, I fell asleep on my couch and awoke to a bite or sting on my wrist. When I went to the bathroom, I found another scorpion on the sink. I went back to the couch and lifted the cushions to find 2 more scorpions in the couch. They have all been brown and about 1 inch long. I have 2 young daughters that visit weekly. The apartment owner lives out of state so I believe I may need to deal with this problem myself. What to do? First, I suggest you read the article above. 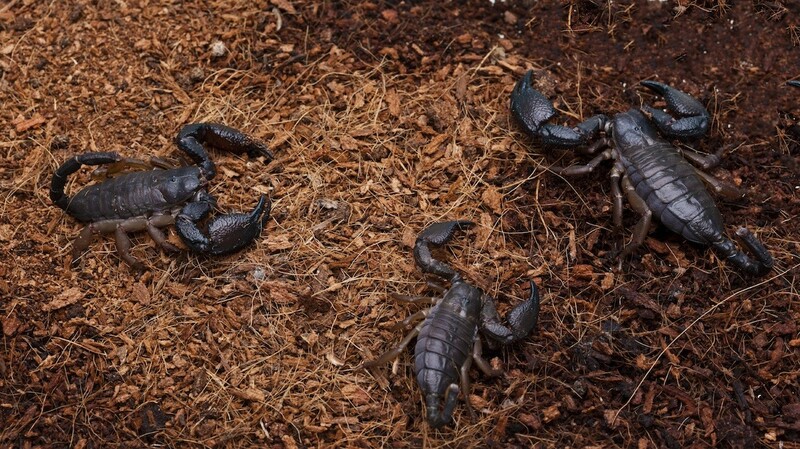 This will explain in detail the various treatment options that can be employed to deal with bark scorpions which are no doubt the ones you have. These are commonly found in Georgia but with a little work and some of the products listed above, you’ll be able to keep your apartment scorpion free. The one product we don’t have listed above but what I highly recommend you get is the Phantom Aerosol. This is an odorless aerosol that can be applied to the furniture where you’ve been finding scorpions. Spot treat all your furniture too since any fabric could be a nest site based on what’s been happening. Pull out any cushions and spray under them as well as the framing of these pieces. Next, dust any attic or wall void space you have with the Delta Dust. This is a long lasting material which will take away nest sites that might be keeping the scorpions in close proximity to your living space. Now don’t forget the outside. You really need to get some Deltagard Granules applied followed by some Cykick sprayed over the top as well as the exterior of the garage. These two products will take care of any scorpions living alongside the building which in turn will decrease the amount coming inside. Lastly, set out some scorpion traps to help monitor the problem. I have lived in the same house for 13 years. I have never had a scorpion problem and have only seen 1 in that time frame until recently. In the last two weeks we have killed four in the house. About 6 weeks ago, we had the house exterminated. Last year I had a barrier installed in the attic over the insulation to assist in heating and cooling. I am not sure if the critters have moved in from the attic or could have been brought in a box or something. These have all been adults. I am having the house treated for scorpions but it is expensive and I think it is something I can do myself going forward. I am not comfortable with them being in my home and one family member has been stung already while sleeping. I just wonder if the barrier I put in the attic last year is causing them to migrate into the home or what exactly is the cause of them infiltrating. If you read our Scorpion Control article above, you’ll learn that scorpions forage where they can find good food supplies. And good food is where they find live insects. So my guess is the exterior of your home is not receiving regular pest control in the form of granules and liquid sprays. Without these products being applied on a regular basis throughout the time scorpions are active in your region, there would be plenty of food for them to find and become dependent upon. In fact, pretty much all homes that get a scorpion problem in the first place has their exterior infiltrated and from there, it’s just a matter of time before some end up inside. So at this time they’ve no doubt moved onto and most likely into your home based on the amount of activity you report. And yes, treating inside the home is needed as explained above. But if you want to keep new ones away for good, get the exterior treated thoroughly as well as the attic and all routes of entry into your living spaces. This way you get them on all fronts; taking away their food, killing the ones nesting in your house and putting in place a protective barrier to keep them out of your living spaces. As for “barrier” you mention? Who knows what if any role it may play. But I do know that right now you’ve got a problem that will be have to be treated the same way whether you leave the barrier in place or remove it. In other words, the barrier is a none issue at this time. Read your article above, thank you for all the helpful info. I have a young toddler in the house (who was stung last summer by a Bark Scorpion…horrible), what concerns do I need to consider about the products you mention when I have a little one in the house who is every where and constantly putting everything in her mouth? I appreciate your concerns regarding a young child and the use of pesticides in the home. But the reality is that when used properly, there will be no risk or inherent danger presented to her or anyone else for that matter. Here’s why. As explained above, the outside is the key area that must be treated to keep scorpions out of the living area. Perimeter treatments done to the turf and foundation are what will keep them from nesting in the home. These applications should be done as our safety videos explain; with no pets or children around during the application. And once allowed to dry, these same treatments will not present any hazard to people and pets walking over the treated areas. Also in our article you’ll learn about treating attic spaces and wall voids which are usually key scorpion nest sites. When treated properly, no pesticide used in your attic or wall space should end up in your living area and therefore no risk or danger will be presented to people inside – including your toddler. Lastly, in my experience, the two treatments listed above will many times solve the local problem with little if any treatment needed inside. And without any treatment being done inside, there would be no risk of anyone getting exposed. Now you could use this exact approach because of your concern. But the reality is that if you did want to treat you baseboards and allowed them to dry before letting anyone around them, the risk of getting a significant amount of pesticide to transfer is pretty much non existent. Remember, the products are first mixed with water making them very dilute. Next, they’re sprayed over a large area leaving very little active in any one space or area. So even if someone was to lick treated surfaces, they’d have to work very hard to ingest any amount of the product. The other two routes of exposure, dermal (through the skin) and inhalation, would be even less likely to happen. Now obviously if your toddler was to drink any of the concentrate, there would be a problem. Much like gasoline, bleach or ammonia, the consequences would be a lot worse compared to getting stung by a scorpion. But if you keep the product stored out of your toddlers reach, this should never happen. And if you use the right amounts when spraying, there would never be enough of the product present in any one location to be a problem. Hope this answers your concern and if you have any further questions, give us a call toll free at 1-800-877-7290. Had a harrowing experience last night. As we went to bed, my wife jumped up because something was ‘crawling’ on her. Turned on the light and an adult scorpion was crawling down her arm. She swatted it off with out getting stung and I killed it. How in the world do you scorpion proof a bedroom? She couldn’t sleep at all last night and I am sure there will be the same problem tonight. For now you need to read the article above and then get the products listed to start a pest control program targeting this pest. No doubt the outside should be treated with the listed granules and spray. For inside, spray the baseboards with the Cykick but also set out the Scorpion Traps. I also suggest “scorpion proofing” your bedroom by dusting all routes of entry with the Drione Dust. And if your bedroom is under an attic space, dusting that space with Drione would be smart as well. Do I need to get the Phantom spray if I am already ordering the Drione dust to help treat the inside of my house? As explained above, the Drione is for hidden spaces like wall voids, attics, etc. and not so much for the open areas. This is true mostly because it can leave a visible residue (white powder like confection sugar). For this reason, Drione is generally not applied out in open living spaces. But since scorpions can no doubt live just out of sight in these open areas, the Phantom would be the preferred product to use since it goes on “dry” and has no odor. I have had the run around with pest control companies and being ripped off by them. I have only seen 1 scorpion outside my home and none inside. I had them do a first time treatment inside and out ( while I was home ) about 3 months ago and still have not seen one yet. I’m living in Arizona by the way. What do you recommend I do from here on out to keep up with the treatment since they want to take my money and not provide the service? I have spent 250.00. 150.00 for first time treatment and 50.00 a month and see I could have spent that doing it myself and not pay the 50.00 a month fee. Please let me know. I’m not just scared of scorpions; I have a big fear. More like a phobia. No joke. When I found the one outside I couldn’t breathe and sat in my car for about an hour…..please help! Lot’s of people fear scorpions so you’re not alone. And the good news is that if you do regular treatments around the outside of the home, you can keep them from wanting to nest on your property which is really the best way to avoid them altogether. So for now I suggest you read through our article above to get better educated on this pest. In the reading you’ll learn all the best practices that can be employed to keep them away. No doubt you can do a lot but based on the details you’ve provided, I’d say there is really only a couple of things you should do. First, every 2-3 months you should treat the perimeter of the home with the Deltagard Granules. Treat around the entire home creating a good 20 foot “treatment zone” out from the foundation. Flower beds and mulch piles will be key locations so get these good. Next, spray the ground and the house siding with the Cykick CS. Lastly, inside the home, set out some Scorpion Traps. Get at least 6 set out as they’ll do a good job monitoring anything that happens around the home that may have been missed before. If you follow this regime, you should be able to keep all insects and other pests in check as well as any scorpions. Now there are more treatments you can do which is covered above but for now, I don’t think they’re needed since you don’t have much (if any) problem. But at least doing this work yourself you’ll know it’s getting done properly. 2nd, would you recommend treating the “wall” that separates the open area between the golf course and the backyard? No doubt doing some extra “sealing” will help keep out all bugs. I would do this after the house is built and maybe just prior to it being painted. This will probably cost you more dollar wise if you have the builder do the work but if you’re a “do-it-yourselfer”, you can get a Foam Gun and some Pur Foam from us and do the work yourself. I did this in stages at the house I built by working on weekends and a few evenings during construction. Next, doing some treating during this time would definitely be worth it too. In my experience, the best material to apply is a product called Drione Dust since it can last for many years when applied to wall voids. So if you’re able to inject some into the exterior sides of the home during construction (I did this too at times when the crews were gone), it would be well worth your time and trouble. Thanks for a very helpful article. We lived in a one-hundred year-old farmhouse in Oklahoma for seven years and only saw one scorpion in the house. We built a new two-story house a few hundred yards away and have killed around forty scorpions inside the house during our first year. Our new house has stained concrete floors throughout the entire lower story. Are scorpions attracted to new construction or to concrete floors for any reason? Generally the only other insects we see in the house are spiders. If you review our article above carefully, you’ll learn that scorpions are attracted to areas where there is an abundance of food and not any specific type of construction like concrete or wood. In fact, spiders are attracted to the very same areas and this is a big clue as to what is most likely attracting them. Now “food” to these pests are other insects so since you’re seeing both, my guess is you have an abundance of “other insects” around the home which is attracting the scorpions and spiders. This means only when you reduce this “food supply” will you affectively reduce the spiders and scorpions. So at this time I suggest you do a thorough treatment of the outside ground and foundation using the Deltamethrin Granules and the Cykick CS. Inside the home you should set out some scorpion traps and apply Phantom Aerosol to any crack and/or crevice where you think they might be hiding or living. We bought a second home in the north Georgia mountains last year and have been battling scorpions inside the house ever since. I have a monthly pest control service but suspect the house is just infested with scorpions. For example, outside treatment by pest control one week ago, followed by scorpion in my bed the next day; then thorough inside treatment, moving furniture, everything, glue pads, spraying whatever service uses. That was three days ago and I have killed 3 scorpions per day since then. Obviously I have a big problem. Just how bad??? Do I put the house on the market? It’s never ceases to amaze me how many people will hire a pest control service and then continue to pay them even when they fail to deliver the results they were hired to provide. In general, anyone that hires an auto mechanic to fix a car, a plumber to fix a leak, an electrician to repair a bad electric outlet or a doctor to cure an ailment, positive results are fully expected and well they should be! And in the rare cases where the services paid for aren’t delivered to our satisfaction, we have every right to look elsewhere to find a satisfactory resolution. Yet for some reason many people are willing to endure years of mediocre pest control service which in this day and age makes no sense. I say it makes no sense because at this time there is no reason any pest should be allowed to persist if it’s not wanted. We just live in an age where there is a plethora of great pest control products available and a wealth of information on how to use them properly so really, if you want your scorpions gone, they can be made to disappear. And here’s how. So in this case you’ve been using the same company for the past year and state that you still have scorpions. Well, it’s clear you need to change service companies. I think it’s fair to say you’ve given your current company plenty of time to solve your problem and clearly they’ve failed. Now it’s time to move on. And you shouldn’t feel bad about doing this either; no doubt some companies are better resolving one pest issue over another and with that being said, it would appear the service you’ve been using has a hard time with scorpions. That means you should start looking for companies that claim they can handle scorpions. Now it’s only fair that you be up front with them. Let them know the history of the problem, the amount of treating that’s been done, etc. And when you find a company that says they can take care of the problem, give them a shot. I would say 6 months would be a fair amount of time to give any company a chance. Especially given that it’s late November already. If you give any new company 6 months, it will mean they’ll have till May of 2013 and if you don’t see any active next March-April, they will have solved the problem because that’s a busy time for scorpions for sure. Alternatively you can get the products we have listed in our article and start treating yourself. If you feel you’re up to the task, then tackling this problem yourself can most definitely be accomplished given the right tools and technical support. We’ve been helping people solve all kinds of pest related problems for over 20 years and no doubt it can be done. In fact, there is no problem that can’t be solved so in the end, my only advice to you is either hire a service company that will do the job properly or do the work yourself but no way will I ever recommend putting the house on the market because of some pest related issue. In this day and age, any pest problem can be resolved with a little hard work and time. In summary, you may want to read our article above and if you have further questions, give us a call toll free. I’m confident if you get the right company in there to treat or if you follow our recommendations and do the work yourself, you can make this house scorpion free. We are moving to the San Antonio area and will be living in a 5th wheel for a month or two while we find a house to purchase. Is there anything that we can do to prevent scorpions from getting in the 5th wheel? Am I worrying for nothing? Is it common for them to be able to get into a 5th wheel? I think I am so nervous because I was stung while I was sleeping when I lived in Arizona. So now I am paranoid that I will be stung or worse, my 3 year old daughter will be. Can they crawl up the siding on the 5th wheel or is it too slick? What products would you recommend (if any) for us being in such a small space, with a 3 year old and 3 dogs? Also, when we purchase a home, is there a product similar to the bug bomb that we can set off before moving in? Or would you recommend treating the house and area with something else before we move in. I have been to Texas many times, for long periods of time, and have never seen one even though I am always tromping around on the farm. We will be inside the city limits so we won’t have land or anything like that, just a regular residential home and yard. Thanks so much. Scorpions (like most any pest) will commonly take advantage of manmade structures which are left untreated and unprotected. 5th wheels are no exception. So if you set up where scorpions are active, there will be an inherent risk that some could forage up the side of the structure and get inside. To prevent this from happening, you should treat the exterior siding with the Cykick CS listed in our article above. It’s odorless and treatments will last 1-2 months keeping scorpions and other unwanted pests off your 5th wheel. Nothing would be needed inside the structure (assuming you don’t have pests inside) and if you treat the outside right after you arrive and set up, nothing will be able to get in. As for the new home and scorpions; forget about any kind of indoor fogger or bug bomb. Simply put, these are a waste of money and don’t work. This is especially true for scorpions. But what would work is to treat as our article above explains. Start by placing out some Deltaguard Granules around the home. You’ll need to apply 5-10 lbs per 1-2 months to keep the treatment active and strong enough to keep scorpions out. Next, spray the outside of the home with the Cykick CS. Use 2-3 gallons per treatment and if you follow this procedure, you won’t get scorpions or any other pests inside. 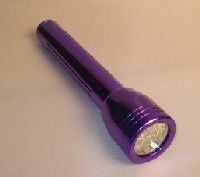 Lastly, I strongly suggest you get one of our Black Light Flashlights. These will enable you to see a scorpion in the dark and are very helpful to use at night to locate where they are foraging, nesting, etc. Need some advice…I need to store my furniture in san Antonio for 6 months. I want to keep my furniture free of scorpions, bedbugs, roaches etc…Is there anything I could do to prevent creatures from living these pieces? I have no control of my things after it is packed up. No doubt scorpions, bedbugs, roaches and other pests love nesting in furniture. Insects typically like cellulose (wood) and when the cellulose has cracks, seams and other hidden locations ideal for nesting, it becomes a prime location for foraging bugs to locate and use. The good news is you can treat your furniture to prevent this from happening. And you will only need to use one product to accomplish this goal. This one product (not surprisingly) is one of my favorite materials and can be found listed in our scorpion, bedbug and roach articles. And the name of this product is Drione. Drione is a dust. It’s a lot like baby powder in both consistency and color. And where it’s applied, insects will not go. So not only does it have insecticidal qualities, because it’s a dessicant, it has a natural ability to repel insect pests too. So in this case, if you apply small “puffs” of Drione to all the joints, seams, etc. of your furniture, you can effectively make these locations uninhabitable to insects. Mind you it won’t take much Drione; just a light squirt is all you need to apply. And you don’t need to leave any visible after dusting; only the dust in the gaps and seams of the furniture joints and cracks are where the pests would nest anyway. So if you see any on the surface of the furniture, it can be safely removed with a damp rag or paper towel (water renders Drione useless). Now on the Drione product page, there is a video which talks about why Drione is so good to use and in this video you can see how it comes out when applied. This visualization should show you how it can be put to work for you. Lastly, I’m sure if you were to dust your bed frames, dressers, tables, chairs, etc. with some Drione prior to putting it up in storage, I’m sure you’ll be able to keep it all protected and pest free during storage. We have been having major problems with scorpions, but also unable to get rid of the roaches. We have tried everything. We are seeing 5-15 scorpions a day, in the daytime. We live in a log cabin surrounded by woods and have kids and pets, frustrated with extermination company. Suggestions? Thanks Kari. If you want to get rid of the scorpions, you’ll need to get your service company to apply the products we have listed above in our article. Now if they won’t apply them (and they must use enough of the listed products too), then get some of the granules and spray and do the work yourself. No doubt this would prove less costly and in most cases, more effective. Remember, service companies will use as little product as they can to get the job done so in general, they’ll start with small amounts and only increase the amount they use (and the frequency of treatments) only if you complain. But if you don’t say anything to them, they won’t treat any more than the bare minimum. No doubt allowing scorpions to live where kids and pets are present is risky. And since roaches carry all kinds of disease, they shouldn’t be in the same area either. Unfortunately these pests require persistent treatment regimes so if your service company isn’t willing to do what’s needed to get rid of them, take matters into your own hands and I’m sure you’ll see positive results. Hey Guys! Thanks for the article and all of your products. I had a problem with scorpions in my house last year and came across your article. I ordered the products you had listed for both outside (Delta-Guard and Cykick) and inside (Delta-Dust and Drione Dust) and was extremely pleased with how quickly they arrived. I do have to say, however, I think my particular scorpions could read. When my shipment arrived, I unpacked it and placed the items on a shelf in my garage as it was going to be about a week before I had the time to use them. Prior to ordering your products, I was finding 3-4 live scorpions a week in my house (with a professional pest control quarterly service). This went on for about 6 weeks before I came across your article (with a lot of pressure from my wife to do something or move…). The week between the arrival of your product and my subsequent applying of the outside treatment, I only found one scorpion. Hence my comment that they could read and knew their demise was imminent. After the application, I found a few DEAD scorpions throughout the next several weeks. Come to find out, my wife much prefers the dead variety. Here it is just over a year later and I had to bring out my vacuum/zapper this morning to grab one that went across my bathroom floor. So, in addition to what I did last year, I want to use a liquid inside as well. Re-reading through the article and the responses, I believe I need the Cyonara EC or Onslaught product to use where I don’t want the Drione Dust to be visible. Is one of these better, or can I just flip a coin? Sorry it took me so long to get to my question. I just really wanted you to know how satisfied I am with your products and service. Now since you’re wanting to do some inside treatments, there are a few products that are ideal for use in the home and you mentioned two of them. But they are used in different areas so don’t get them confused. Here’s what I mean. Drione dust is a special product that should be used in hidden areas like wall voids, under tubs, in attics, etc. It lasts a long time and when applied to these areas, will prevent scorpions from nesting and then moving into living spaces. So Drione is generally applied into small cracks and crevices scorpions might be using to enter a living area. A good example of such areas would include under a light switch cover, inside an electric outlet, inside a light fixture where it mounts to a wall, under sinks in the holes where water and drain lines enter the water cabinet, etc. Dusting these areas lightly with Drione will make them unusable by scorpions so they will not be able to pass through and come inside the the living space. And if you find most activity coming from “above” like ceilings and on the walls of the living areas, dusting your attic with Drione may be in order. Doing so will provide a good year of protection (from all insects) making the area uninhabitable by any kind of pest. For some homes, this is an important area to consider so don’t rule it out. Now for the living spaces, the Onslaught would be a great choice to spray. So for baseboards, foundation walls, crawl spaces, etc., a liquid application of Onslaught every month would be suggested when you see activity; once they’re gone you can go 2-3 months in between treatments to make sure they (or any other insect) don’t return. Two other products to consider are Phantom Aerosol and Scorpion Traps. The Phantom aerosol is a unique product in that it goes on dry and is odorless making it a good choice to use around tiled or hardwood floors. Basically any rooms you want to treat but can’t spray because the liquid is a bit too messy. Phantom comes with a small straw you can use to direct the spray into any seam or crack. And only small doses are required so you can get these areas properly treated without making a mess. Lastly, Scorpion Traps can really help by catching rogue scorpions you might otherwise not know about. 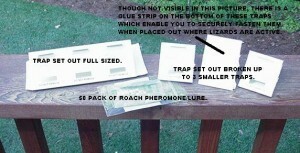 So setting 4-6 traps throughout the home can many times alert you to problem areas you may have otherwise not noticed. Hope this answers your question; give us a call if you need more help! 1-800-877-7290. We moved into a new home 6 months ago. In the past 5 weeks I have seen 3 scorpions in our house. 2 alive and 1 dead. All of them bark scorpions. Does this mean we have an infestation? Are we always going to have to deal with a scorpion problem or do they eventually move on? I’m already so sick of this place I’m ready to move out. I have a 2 year old daughter and a small dog. I’m always on high alert and can never relax in my own home. There is a field behind our house and our neighbor just built a pool. I should add we have treated the property with granules and liquid spray both professional grade stuff. First, you definitely have a problem. Second, there is no need for it to be ongoing. If you treat properly using the products we have listed above, you can get control of the infestation. But the key will be to treat inside as well as outside. And you must remain diligent. In other words, it will take 2-3 months of treating before you see decent results. So for now, get some Deltagard Granules and start applying them once a month around the perimeter of the home. Do this every month. Next, spray the foundation and turf with Cykick CS. Next, treat all the baseboards inside living areas with PT-Phantom Aerosol. This odorless spray goes on “dry” and works well on scorpions. Lastly, set out some Scorpion Traps throughout the home. Now if you follow this recommendation and renew the applications once a month, you will have this problem resolved within 2-3 months.